It’s not just about taste – it’s also about how much effort and time it takes to make your cup of coffee. The ROK Espresso Coffee Grinder is perfect if you want to immerse yourself in the world of artisan coffee, but don’t want to spend all their energy in the morning grinding their coffee beans. So if you are looking for a coffee grinder that’s easy to use, and produces quality grinds at half the time compared to its competitors, then I recommend the ROK Coffee Grinder. If you really are one of those who make their coffee in the morning before the rest of the world wakes up, then you’ll be pleased to know that this coffee grinder makes very little noise – 75 decibels only. You can be certain that you won’t wake anyone up when using it. Equipped with the double bearing shaft’s stability and 48mm stainless steel conical burrs, the ROK Coffee Grinder is one of the best manual coffee grinders out there. In terms of grind results, the coffee grinder produces grinds that matches electric burr grinders at the $600 range. Overall, this burr grinder offers an alternative solution to Espresso lovers without the hassle of noise and complex operations. Coffee beans bounces out of the hopper frequently. As I’ve mentioned just now, like all manual coffee grinders, the ROK Espresso Coffee Grinder is great for those who want to get the full barista experience, and grind their own coffee beans at home. This product is ideal because it requires little effort and time, and can produce results at the fine – mid settings similar to electric burr grinders at the $600 range. Of course, this all comes at a higher price, it’s significantly more expensive than majority of other hand-held coffee grinders out there – if you’re on a budget, you should check out the upgraded Hario Skerton instead. Otherwise, a coffee grinder is a lifelong investment, if you are an Espresso lover who have some spare money to spare, then I recommend the ROK Espresso Coffee Grinder to you. This ROK Kitchen Tool's coffee grinder is constructed in aluminum, a vertical crank on the side, and a calibration wheel that is built to adjust the coffee grinder’s settings. The ROK grinder uses 48mm stainless steel conical burrs and designed to reduce wobble (that causes inconsistent grinds) with its double bearing shaft design. This is a conical burr grinder that uses 48mm stainless steel burrs. It's designed with double bearing shafts to reduce wobble during operation. Based on the material and design, I think it's very durable. The ROK Espresso Coffee Grinder is very easy to use because it’s designed with human factors and ergonomics in mind. Instead of the traditional, horizontal crank, this grinder’s crank is placed vertically on the side. This makes the grinding process a lot more natural and efficient. With its efficient crank design and double bearing design, the ROK Grinder takes around half the revolutions required by other manual coffee grinders. For example, a standard coffee grinder takes around 190 revolutions to grind a double shot of Espresso, but this grinder only takes 62! As such, it takes a lot less time to grind coffee. Unlike nearly every other coffee grinders out there, you can adjust the ROK Coffee Grinder's grind settings on the outside - you don't have to take anything apart, it's very straight forward. In-order to clean your ROK Espresso Coffee Grinder, we should wash it occasionally with water and soap – but don’t put it in the dishwasher, it will erode the grinder’s high-quality finish. You also need to clean the diaphragm, water cylinder, and plunger using warm, soapy water. Remember, before using it again, you must dry it thoroughly. Lastly, you can clean your portafilter can be cleaned by simply removing it and rinsing it with water. When I used the grinder, I noticed that there are lots of residual left in the hopper and on top of the adjustment wheel - it creates a little bit of mess that's quite difficult to clean. The price of the ROK is quite steep. It’s way more expensive than other hand-held coffee grinders, but at the same time, it’s quite cheap considering the fact that it produces grinds that matches high-end coffee grinders. I personally think if you have the spare cash, want to be immersed in the barista experience, and at the same time…put in the minimum effort, then you should go for this grinder. The ROK Coffee Grinder comes with a 10-year warranty for all metal parts, and 1-year warranty on other parts. If a part becomes defective, all you have to do is send a photo (via email) to customer services, and they’ll send you a replacement part – delivery charges will be handled by the customer though. 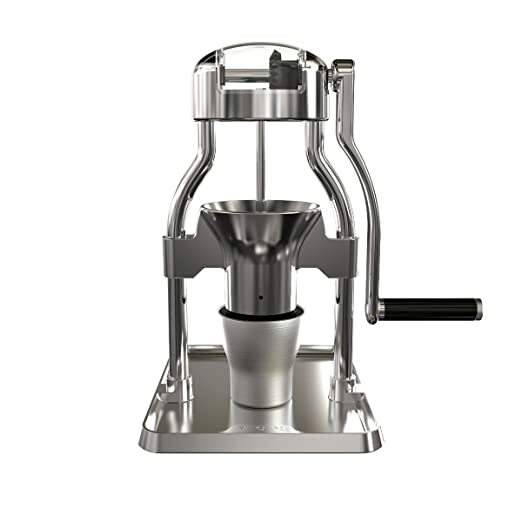 The ROK Coffee Grinder is one of the best manual coffee grinders in the market at the moment. It would be our favorite if it was cheaper like the Hario Skerton. As it stands, you’re essentially getting the results of a high-end product, at the mid-range price. The quality of the grind is great at the fine – mid settings, so it’s perfect for those looking for anything from Turkish to Pour Over, but this is probably not suitable for those looking for French Press. Overall, I would recommend the ROK Coffee Grinder to Espresso lovers who want to immerse themselves in the world of artisan coffee, and at the same time, have some cash to spare.